The holy pilgrimage site is bordered by monasteries belonging to the different branches of Buddhism. Hotels and other commercial establishments are not allowed in the vicinity to protect the sanctity of the place. 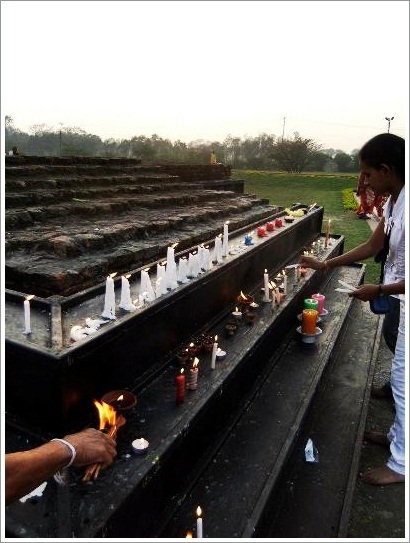 Lumbini Gardens can be accessed from the main road either by a short walk or in a cycle drawn rickshaw. When we stepped into the main garden complex, we were welcomed with love by the soft chants of “Buddham, Dhammam, Sangham Saranam Gacchami “ that wafted in with the cool Himalayan breeze. We walked towards Maya Devi Temple, beautiful white structure that contains the site of the Buddha’s actual birth. Inside the temple, we stood by the Marker Stone, denoting the birthplace and the sculpture on the wall alongside depicting Queen Mahamaya’s labour. Queen Mahamaya gave birth to Buddha (587 BC – on a full moon night in the month of April-May) in Lumbini Gardens beneath the Sal Tree, holding on a branch, accompanied by her maids in waiting. Forklore from Vajrayana Buddhism mentions that she was taken to Lake Manasarovar by four divine beings, lovingly bathed in its pure waters and then a elephant holding a white lotus in its trunk went around her three times and finally entered her womb!! She knew she was chosen for delivering greatness to the world but alas never lived to see her beloved son’s greatness. On the side of the temple is the Ashoka Pillar, erected in 249 BC marking King Ashoka’s visit during the 20th year of his reign. The brick platform next to it, appears to be a remnant of an ancient stupa where the devout offer candles and flowers to the Lord and his mother. There is a pond or pushakirini alongside the temple which is believed to be the place where infant Buddha was given his first purification bath. A sat there smiling to myself , imagining the master as a child. I sat on one of the planks under the tree, which is an ideal spot for meditation with the ongoing chants of monks lulling my mind into a quiet retreat. I would highly recommend visitors to walk through the lawns, soak in the ambience and find a quiet place to meditate. It is a beautiful place to spend the evening, with the sun slowly disappearing between the trees, lending a orange hue to the sky and soft soothing chants wafting through the air. If there is a definition of feeling peace, this is it. Overwhelmed by the peace and calmness of the surrounding, it is not uncommon to find pilgrims humming “Buddham Sharanam Gacchammi” in gratitude for the opportunity to visit this holy land. While walking through the lawns,we met Sagar Dhamma, a monk and an old associate of Nithya Shanti, our teacher. Sagar Dhamma, had given up his career with UNESCO, in Srilanka, years ago to explore Dhamma as a break from his hectic life. He can be seen chanting in Richard Gere’s documentary on the Buddha. He answered our questions patiently, spoke about the aspects of Buddhism and as a parting note told us to be mindful of the Qualities of Dhamma. The sun was off the horizon, twilight giving way to yet another evening and heralding the end of a happy, fulfilling and beautiful day. If there is time on hand, visit Tilaurakot, Japanese Peace Stupa and Lumbini Museum and indulge in a bowl of authentic Thukpa accompanied by steaming hot momos. Located in Southern Nepal, Lumbini is very close to the Indian border (Sunauli). The best way to reach is to take a train from New Delhi to Gorakhpur and then take a taxi to the Indian Side of the border and another taxi from the Nepal side of the border. The closest airport for Lumbini is Siddharthnagar in Nepal which is connected to Kathmandu. Alternatively, if you are in a group, plan to hire a car or a bus for the day from Gorakhpur in India. Hi, Where did you stay when you visited in Lumbini? It says in the article that hotels are not allowed in the area? Thank you! We did a day trip to Lumbini from India so we did not require to stay. The teachings of Buddha are very simple and realistic.